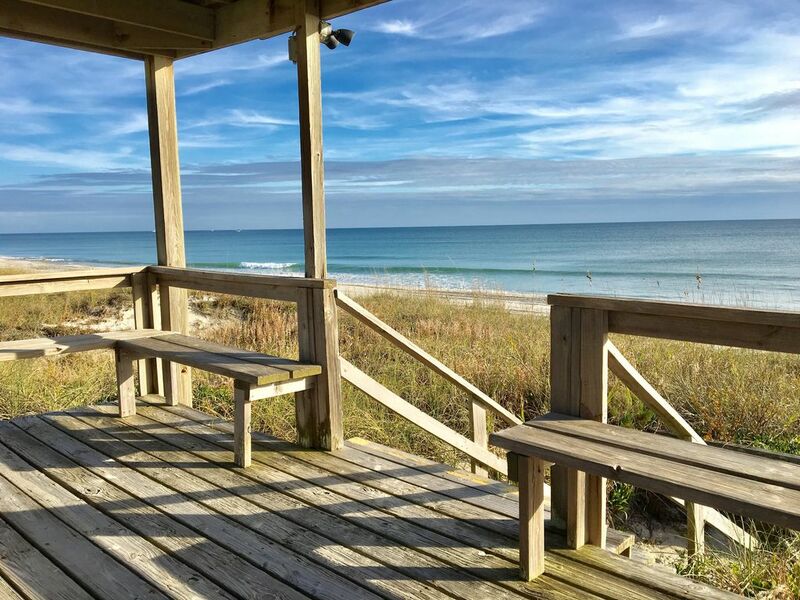 This Ocean View Studo is located just 50 steps from our Pristine Secluded Beach in an OceanFront Resort named Ocean Sands. Completely remodeled in Apr 2019 this Cozy Condo features a New Custom Tile Shower, Luxury Plank Floors, New Dresser, Cabinets/Countertops, Fridge and the list goes on. We even have a comfy gel infused sofa sleeper mattress so everyone will be comfortable. Enjoy Panoramic Sunset and Sunrise Views from our Gazebo's and shared Balconies. Unwind by our 8 foot deep Crystal Clear Pool. Enjoy local culinary experiences, or BBQ on one of three outdoor grills and enjoy open air picnic table dining. A large outdoor grassy area and a separate 1.5 foot deep fenced in kiddie pool are perfect for the little vacationers. Complimentary WiFi, Basic Cable and HBO are provided for your media enjoyment. Restaurants and Molly's beach bar, are a short walk away. Linens are included for your convenience. - Max occupancy 4. Ideal for 2-3 adults or 2 adults-2 children. - This is a SMOKE FREE COMMUNITY. No smoking on the premises. - Sorry but Pets are not allowed per Homeowners Rules. - 2 vehicles max allowed per unit rented. - Facilities (pool, parking, and beach access) for registered guests only. - Unit professionally cleaned prior to your arrival. No daily maid service. - Coin Operated Laundry facility on site. - Once booking is confirmed you will receive an information packet via email to help you prepare for your stay. - This is a privately owned vacation rental and not a Hotel thus we include a List of the Association Rules, which all guests must follow. We have multiple units in the same complex, so If you need more than one unit, or if we do not have your dates available in this unit, message us for assistance so we can provide additional options. Perfect getaway for a romantic weekend, or a family retreat ... watch dolphins splash from the oceanside gazebo ... don’t miss the sunset disappear beneath the ocean waves .... stroll the sandy beach ... build a sandcastle with the kids ... surf cast or fish from nearby pier ... watch surfers hang ten.... or just relax by our chlorine free all natural saltwater pool, and fenced in kiddie pool for those with small children. We are a military family, blessed to have discovered the Crystal Coast, while stationed in the area. If you are looking for a Clean and Cozy Beach Getaway, literally 50 steps from the condo to the warm Sand between your toes, then you have found the right place! Come join us for some Sun, Surf & Sand! It's truly beachfront, the people are very friendly, and the Location is Fantastic! This beach condo has everything you need to make your summer vacation, or your weekend get-away a memorable experience. This property is a hidden gem that many people just don't know about! The truth is that many owners want to keep this piece of private beach a secret. The setting is amazing. Enjoy our charcoal grills, and have dinner with your family on our brand new picnic tables. You can enjoy the sunny outdoors, while listening to the sound of waves breaking on the shore, and the aromatic aroma of sea salt in the air! Ocean View from Inside the comfort of Your Space. 85 steps to the beach! Ocean View from inside the space. Complex is located Oceanfront. You cannot get any closer. Unit has an Ocean View. Ocean is 85 steps away just to your right. Ocean View from Unit. Panoramic views from shared balcony. Oceanfront Complex with Panoramic Views from shared Gazebo and Complex Spaces. Linens provided for queen bed and queen sofa sleeper. Secure Hi Speed Wifi provided in unit. 1 bath towels/wash cloths per registered guest and 1 hand towel are provided. I have a drop leaf table, so that you can use it for two or turn it into seating for four people by using the futon. Huge Grassy area to relax and unwind. You can rent them nearby. We have a bike rack for storage. Wraparound style balcony connects the rooms. There is outdoor seating available on first come first served basis. Fantastic Oceanfront Location! Plus you have a fully equipped kitchen at your disposal. Unit is professionally cleaned prior to your arrival. There is no Daily Maid service. This is a No-Smoking Community. Smoking not allowed on the premises. Guests must agree to read and adhere to Condo Association Rules as you will be our personal guest. Failure to follow rules could result in loss of damage deposit, additional fines and potential eviction. Cozy and clean condo with comfortable beds, and a mini kitchen with fridge, freezer, stove and microwave. We had a lovely time. Beautiful beach steps away and outdoor shower so you’re not tracking sand inside. My family and I had such a great time at this beach condo. The condo is so close to the beach and it even has a view of the ocean which my husband really liked. The kids loved the pool and we grilled out on the BBQ. The beach was very quiet and it kind of felt like we had the place to ourselves. We were even provided beach chairs and an umbrella which was super convenient. We followed the owners advice and had lunch at Molly's which was also really good. I'd definitely recommend this place to others and hope to visit again soon. Felt like a bad motel... Poor building condition, loud AC, lumpy bed colored an otherwise great location. The location could not have been any better. Some items in the condo was not working but I got a quick response when I reported the issues. Hi Anthia. Thanks for your review. I'm glad you enjoyed the location. There just aren't many places this close to the beach and only a few in this community that have an ocean view. Thanks for letting me know that the closet door had come off the rails. I was happy to contact the handyman and get it fixed as soon as he was available. Have a great rest of the summer and hope to see you next year. Absolutely loved staying here! Everything was perfect! Will be planning another trip in the very near future! A quaint little spot by the beach. I would recommend to friends. Thanks so much Kelly! We really enjoyed having you to the beach. Feel free to message us directly at oceansands.beachcondo@gmail.com to save some money on your next stay. Attractions this year: Atlantic Beach Music Festival, July 4th fireworks, MCAS Cherry Point Airshow, Beaufort Music Festival, Big Rock Blue Marlin Tournament, NC Seafood Festival, Summer by the Sea, Pine Knoll Shores Aquarium, Salter Path Clam and Scallop Fest, Flounder Surf Fishing Tournament, Buddy Pelletier Longboard Contest , Beaufort Blackbeard Pirate Festival, Ducks Unlimited 'Band The Billfish', Pirate Week at the N.C. Maritime Museum , Carolina Chocolate Festival, Crystal Coast Civic Center functions, Emerald Isle St. Patrick's Day Festival, Carolina Kite Fest, 11th Annual Antique-A-Thon , Fort Macon Civil War Reenactment, Annual Wooden Boat Show. Or just lounge at the beach/pool, fish, surf, play horseshoes, or enjoy the breathtaking sunrises / sunsets. Tennis courts & Golf courses are nearby. Atlantic Beach Bike Path and New Park are ready for you. Bike rentals w/ free delivery are available. -Rates and availability are subject to change. Prices are set by Homeaway using an algorithm based on supply and demand criteria. This means prices may increase without notice until a booking request is initiated. -This is a Smoke-Free Community. No-Smoking on the Premises! Smoking permitted only on the beach or sidewalk near Highway 58. -No Pets (Sorry but this is the HOA rule) -Each Reservation is limited to a maximum number of guests which may vary by unit. Only registered guests are permitted to use the facilities. -Condo Rules are on this website, included in the website lease, and will be sent with your Check-In Documents. -Violations of the Condo Rules may result in loss of damage deposit, or removal from the property without refund. -Electronic Check Payment is our Preferred method of payment. Please use this payment method if able.